“No one knows how to predict when or where a twister will come down from the skies with its menace and sure destruction. They remain mysterious and capricious killers.”Until now. . .
“Twister” takes us into the world of the men and women who chase these storms in the hope that someday they might harness the knowledge needed to more accurately predict the occurrence of this immeasurable force of nature and enable them to save even more lives. “Twister” is inspired by the real-life adventurers who live and work in the Midwest’s “Tornado Alley.” These courageous in-the- field storm chasers are called to action when a tornado watch is issued by the National Severe Storm Labs, who can only predict the likelihood of a twister touch-down. One way to spot the paradigm underlying a particular mythic story is to pay close attention to the ways that people “make small mistakes” when they talk about it. Generally these so-called mistakes are ones that bend the facts a bit so that they fit the deeper Truth better, and in doing this they point to that hidden deeper Truth. In this text, the key to finding the mythic story is in an apparently minor mistake that mixes up two different types of people who look at tornadoes: storm chasers and storm spotters. Storm chasers are not used primarily to provide reliable, on-the-ground verification of severe storms. That is the job of storm spotters, such as members of SKYWARN, many of whom are ham radio operators. Storm spotters are “lay people” trained to observe developing severe weather and are mobilized during certain conditions, to take up prearranged positions from which they monitor the skies. These are the people who actually “are called to action when a tornado watch is issued” and who “witness and confirm” what radar detects. “Scientist as Hero,” is one of several powerful cultural images of science our culture holds as True. In this paradigm, a scientist is a person who heroically lays his or her life on the line to protect the public from the ravages of nature, whether they be disease, natural disaster, or other organisms (including other human beings). This is why the pre-release publicity makes such a big deal about the heroism of the film’s main characters, which is in turn why storm chasers and storm spotters were “accidentally mixed up” in the release. It permitted the scientist storm chasers to be more easily cast in the role of hero. The paradigm of “Scientist as Hero” can be expressed as mythic story very easily: a hero (who is a scientist) selflessly risks life and limb to defend others from a villain (disease, natural disaster, other organism) by using scientific knowledge and technology. In the movie “Twister,” the scientists are in fact the heroes of the story, and tornadoes are cast in the role of villain, symbolizing nature as an enemy from which humans need to be defended by science. Many mythic stories about heroic scientists cast some symbol of nature as the villain. In the past, carnivores or other wild animals were often used to symbolize dangerous nature; wolves, for instance, were often portrayed in European and American stories as bestially ravenous bad guys. Such a view of wildlife is less popular as our society’s views of the environment have changed, but symbolizing nature with tornadoes in the role of villain permitted the mythic story to still be told in strong, clear terms. It is interesting to notice the ways in which the tornadoes in “Twister” really do symbolize the same aspects of nature that used to be represented by wild animals. 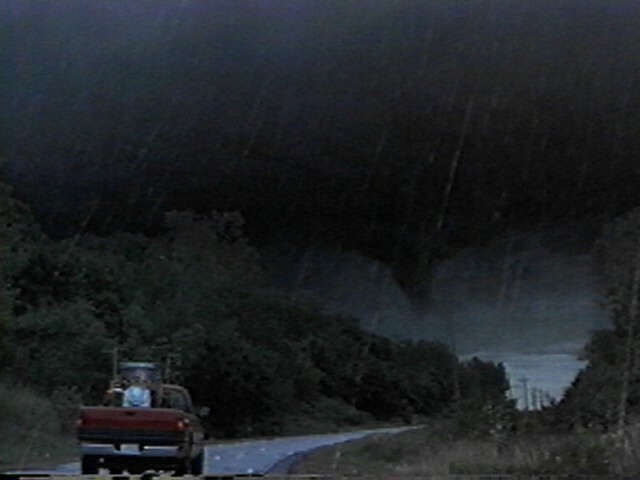 In the film’s final confrontation between a tornado and the scientists, the funnel actually makes growling sounds and behaves almost sentiently, seeming to stalk and surprise the two scientists in terrifying ways. This enhancement of the tornado as an actual villain in turn enhances the heroism of the scientists, and so draws the mythic story heavily enough to satisfy both the audience and the filmmakers. Remember that the original “mistake” that mixed up storm chasers and storm spotters in the publicity was also one that enhanced the scientists’ heroism. You can see now how really significant that “mistake” is. Similarly, the publicity release enhanced the villainy of the tornado antagonist with another small “mistake” that made it more dangerous: the release refers to the tornado as “a three-hundred-mile-an hour wind coming down from the sky,” when in fact fewer than one in 100 tornadoes (the very worst F-5 class) ever reach such wind speeds. In “Twister,” then, we see that tornadoes play the role of a villain, symbolizing Nature as a deadly enemy from which humans must be protected by Science. This film retells of one of the most important mythic stories in Western culture: “Science Protects Humans from Dangerous Nature”. In doing this, the film expresses a second important Western paradigm that lies even deeper: that nature is a dangerous thing from which humans need to be protected. Exploring a culture’s paradigms as they are expressed in mythic story permits us to become aware of the pervasive nature of such paradigms so we can evaluate them for ourselves.